In my mock draft for Buffalo Sports Page, I had the Bills trading away the 22nd pick in order to move up to pick five and get Josh Rosen. However, if you’re looking for the best possible scenario for the Bills on Thursday in the first round of the NFL Draft, it’s this: not having to trade the 22nd pick and still getting a QB is Plan A. If everything falls right the Bills could trade to spots six through nine in the draft and have to give up some draft capital in rounds two or three but still be able to hold onto that precious 22nd pick in the first round. If this happens here are two players the Bills might be targeting. In order for Sean McDermott’s defense to be at it’s best, he needs a good inside linebacker that can run. In Carolina he obviously had the best in Luke Keuchly. The Bills have a massive hole in that position right now. Preston Brown was allowed to walk. Brown was a good player but I believe the Bills are looking for a more athletic backer now. Vander Esch can fill that role. His development in the program at Boise State was astronomical. He started his career as a walk-on at Boise. By the time he finished he was the Mountain West defensive player of the year. He ended his career with a great game against Oregon. In fact Mike Mayock called it the best game he’s seen a LB play in college in many years. Vander Esch, by some reports, had some medical concerns coming out of the combine regarding a neck injury he had a few years ago. More recently teams seem satisfied with him and he’s been cleared medically. The Bills, by drafting a QB, need someone for him to throw the ball to. The Bills receivers at this point are well below average. In fact they are in the conversation for the worst receivers in the NFL. It’s hard to believe that you would want to spend so much on a QB and then turn around and have no one for him to throw the ball to. DJ Moore would help. He had a great combine, running a 4.42 in the 40. The Bills need someone that can get deep and Moore can do just that. 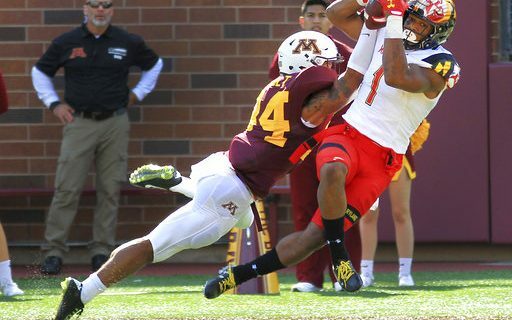 Some have compared him to fellow Maryland alum Stefon Diggs of Minnesota. In spite of poor quarterback play he was the Big 10 receiver of the year. I first noticed him in Maryland’s upset win of Texas early in the season when the Longhorns couldn’t cover him. He had seven receptions for 133 yards. One downside is his immediate impact. He came from a rather simple system in Maryland so he might need a year to adjust to a more complex NFL game. The whole focus of the media and fan base might be the decision at quarterback, but the Bills have huge holes to fill as the draft continues. Linebacker, offensive line, wide receiver, defensive tackle and nickel cornerback are all positions of need that I will be looking for the Bills to fill even after they get a QB.